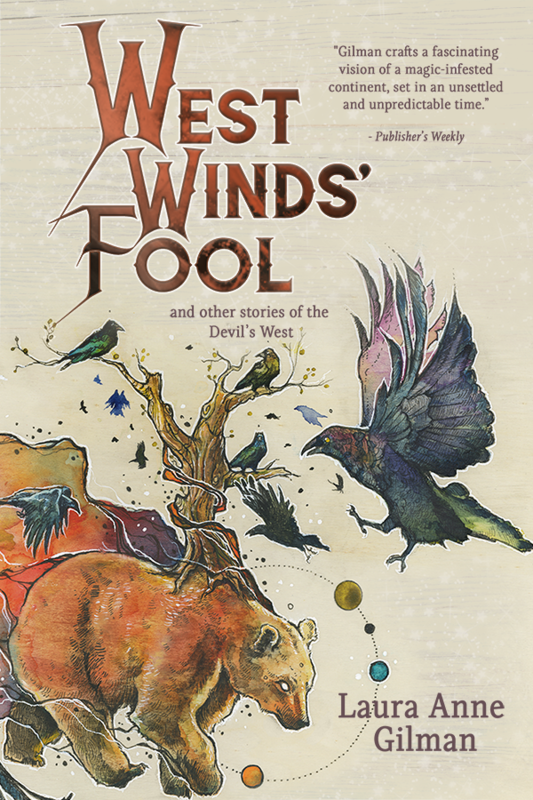 Cover Reveal for WEST WINDS’ FOOL! As some of you know, I’d been thinking about doing a collection of Devil’s West stories for a while – there was a novella percolating in my head, and short stories waiting on my hard drive, and hey, easier for readers to find rather than hunting through magazines and anthologies! But I hadn’t done more than gather the files together, being distracted by things with Deadlines. Then earlier this year I walked through the art show at Norwescon and saw it. My cover art. Okay, it was a painting by Portland-area artist Rebecca Flaum, but I would still swear that she created it for me, for this collection. So I grabbed her card (artists, always put your cards out by your display! ), dropped her an email, and a week later my designer was hard at work on a new cover. Suddenly, I was doing this thing. And what a beautiful thing it is, too. Visit an American West that never was, but could have been. These stories and more welcome you to the Territory, where little is as it seems and everything is what we make of it. Trust the Devil. But Bargain carefully. Available now for pre-order! More outlets coming!